Assists payments providers in assessing the operational status and legitimacy of merchant accounts applicants. 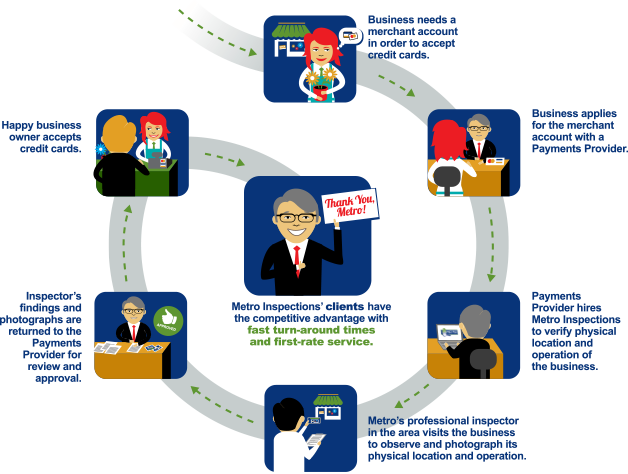 Provides On-site Verification of merchant’s physical location and operation. Conducts professional observations and photographic reinforcement by vetted, well-trained inspectors. Substantiates representations made on merchant applications. Performs intuitive and industry-specific quality review process. business, such as the accuracy of the location address, the type of business being conducted at the location, what type of signage is present and whether it matches the business name. While on site, the inspector will also look to substantiate certain representations made by the business that is applying for the account and take several photographs to reinforce their findings. Metro Inspections will then analyze, scrutinize, and compile the results in order to submit them to the client through its state-of-the-art Inspection Management System. The payments provider is then able to assess the findings as they make final determination on the approval of the application for merchant services.